Saturday May the 6th, 2006 was our day to shine for the first time in around 6 months. It was our next shot at the rather esoteric sport of privy digging. If all went over as we would have hoped, it would be our time to shine, and we would be going home with a multitude of bottles, all ranking in quality or rarity somewhere in between good and amazing - preferably the latter end of the spectrum. Of course - as per constraints set upon our hunting adventures by this little factor called reality - all of our finds weren’t exactly “amazing”, so to speak. The whole thing started while digging a trash pit (which wound up being entirely empty) in my elder brother’s back yard a few weeks before. While in the process of excavating a 4' hole in the earth, we were startled in being confronted by a very curious couple who had moved in next door and were in the process of renovating. I had never thought much of the house - it appeared to be another of those newer, boxy homes they’re assembling like mad on every spare corner lot of Ontario apple orchard and corn field. As it turns out, the house only post-dated my older brother’s by around 20-30 years, and was likely a turn of the century piece of work. The highly amiable young gentleman whom had bought it with his wife proceeded to explain that it didn’t look older, as they had added an addition, and put siding on it. However, in the basement of the front half, wooden beams dotted with square nails run the length of the ceiling. It sounded good enough to me. I popped the question. He said “Sure - tear it up if you want - we’re putting sod down in a few weeks, anyways.” I was elated. Two weeks later, I packed my things up from the local arts celebration festival which my mother is in charge of at around 4 PM, and set off to find some outright, plain ol’ good bottles. My things, of course, consist of the most basic material possessions one could ever need. Never mind food, water, shelter, etc - all I needed were my 4 ½' steel probe, a short-handled shovel, and a plaid jacket. The rest was already waiting at the nearby household of my good ol’ brother, Brent. 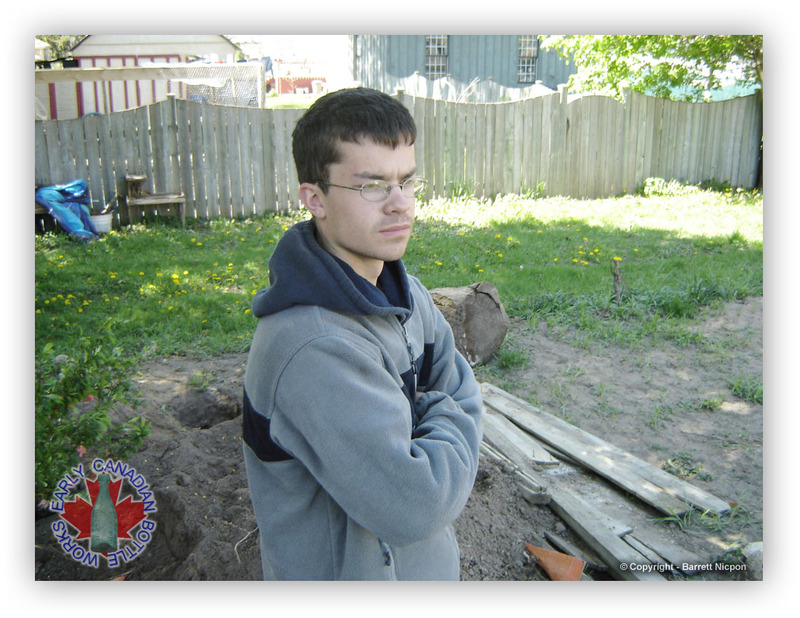 Kyle was to meet me there at the house, and, as I pulled up to commence the digging, there he was, talking to my brother. We got our gear together, and started to probe around a bit. We found two likely spots - one in the corner, and the other in the centre of the yard, along where the back of the property line would have been. Starting with the centre hole, we dug down. Kyle started us off, and things looked good when the sand layer didn’t kick in 6" down, as it does everywhere else in this area. 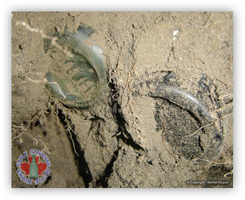 Pieces of iron, calcium deposits, etc, all continued to pour out of the hole, until... there it was... a 1940s pickle jar. We weren’t that disappointed, in all honestly, as we had been digging this sort of thing our entire lives. We decided to dig the pit anyways, for fear nothing else would turn up. Well, nothing else did turn up - in that trashpit - short of a lot of egg shells. Filling the 3' hole in, 1 machine made cork top whisky, 1 clear castor, and 3 pickle jars later, we were a little disheartened. “No worries, though,”I thought to myself, “like I never have said before, but I may strongly consider saying again in the future; ‘there is at least one good bottle in every backyard - if you can’t find it, you’re not looking hard enough’.”. 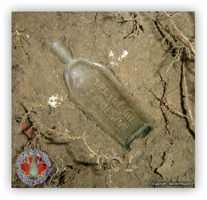 We continued to probe, and, on my shift - I managed to turn up a slightly older vein of bottles. Still likely 1930s or so, but older than the last one. Taking it as a sign of good things to come, we dug it as well. This particular trash pit was slightly deeper than the last one, at around 4' or so. Mere inches under the ground, and we began pulling out corktop bottles. This certainly was an improvement over the screw-cap pickle bottles in the last hole. Dodging speckle-ware pots and tea kettles, we lamented on the aphorism that there really is nothing quite like the sound of your shovel or pitchfork lightly tapping the side of an intact bottle. 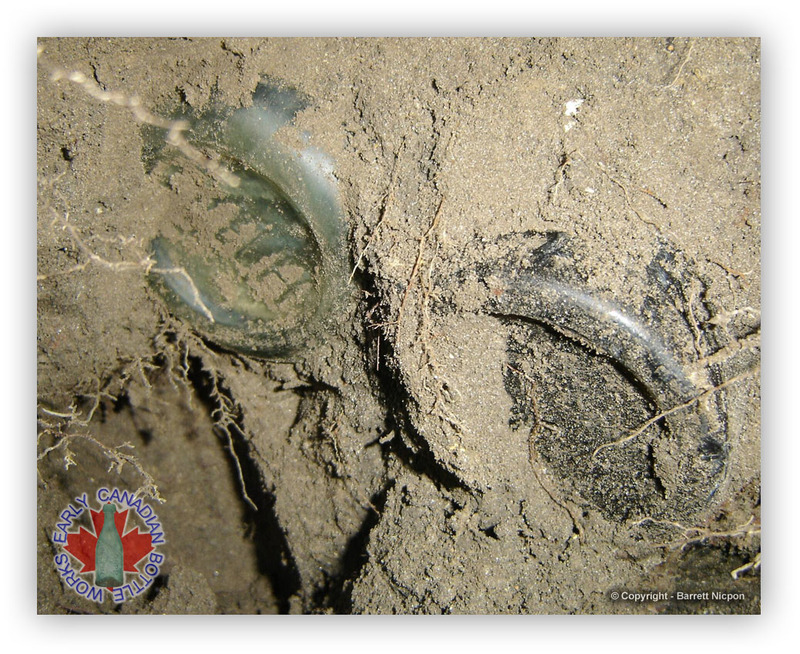 We were fortunate enough to encounter this sound 15 times while excavating this hole. Mostly unembossed medicines, but it was nice to see glass in that age-old light amethyst colour we all know and love. 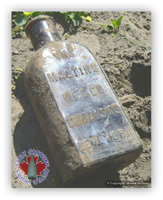 The best pieces to come out of this pit was a singer sewing machine oil bottle (which unfortunately took a bit of a spill on transport back to the house, and is no longer with us), a common Ohio brewery bottle, and a “FELLOWS SYRUP OF HYPOPHOSPHITES” in a lovely light yellowish green colour. We’ve all encountered our Fellows bottles before - but this specialty syrup bottle was a first for Kyle & I. Kyle also turned up a good-condition cobalt blue square ink. It was the first cobalt ink he had ever found. So, once again stricken by the somewhat melancholy mood which is associated with having to fill in a good trash pit, we realized it was getting dark out, and Kyle had to bike home. So, we split up, and I stuck around to do some more probing. “Don’t prove your proverb wrong yet,” I rationalized with myself, “it’s only an infant - give yourself a little more time before you can doubt it.” At this point, I probed in between the slats of a pile of downed privacy fence near the property line between my brother’s house and this one, and heard that golden sound - the sound of newfound hope scraping against the side of my probe. This hope didn’t feel particularly deep, but in the spirit of things as they were, I decided it would be worth my time to investigate further. Of course, I had to move the large pile of privacy fence, first. It was just my luck that Kyle had already headed home. So - I pressed forth and did it myself. Around 10 minutes later, I had relocated the pile (with permission from the still-amiable young gent who owned the house) around 4 metres farther up the fence line, and was digging along the fence line. 20 seconds into the dig, a very light purple-coloured tooled-lip medicine bottle popped out. Unmarked, but again older than the last pit by around 10-20 years. This bottle dated from sometime between 1910 and 1920, which is decidedly my favourite era for digging through. Continuing to dig, I found yet another unembossed, tooled-lip medicinal, and then struck something metal. 8 inches closer to the fence, and I struck it again. Unable to comprehend, I thought about it for a minute, and then dug down a bit to see if I could figure out what this goliath chunk of metal was. I discovered it was an enormous speckle-ware bucket - the first of it’s kind I had ever encountered - and it took me the better part of 20 minutes to dig it out enough to be able to remove it. Finally free of this beautiful obstacle, I was pleased to see that the trash layer continued below where the bucket was. However, at this time, I began to notice that it had become dark enough outside for me to be incapable of seeing what I was digging through, so I decided to call it a day. Having been granted permission to leave this 1' cubic hole open until the following morning, I went next door to talk to my brother for a bit. He was watching TV with his girlfriend, and, naturally, offered me a beer and some of the pizza they had ordered. Eloquently declining his offer, I explained that I believed I was onto something, and thus had to get going... but I would like to use the shower, as I didn’t believe I had ever smelled as bad in my life as I did at this point. He laughed and told me to do whatever I wanted. Taking that in the best of ways, I cleaned up, and then headed over to Kyle’s house to tell him we had to go back the next morning. He arranged for me to sleep over, and at 8 AM the next day, we were up and ready to go. At around 9 AM, after some breakfast, we pulled up to the house, and were ready for yet another day of intense privy-digging action. We set the tarp up, and got started at the hole. I took first shift, and widened the hole, in the process pulling out a few more unmarked medicinals. I had a bad feeling about some potential heartbreakers, as a concrete fence-post anchor had been drilled directly into the side of this particular trash pit. After working for some time to get the pit widened a bit, Kyle jumped in. After mere seconds, he had found something. 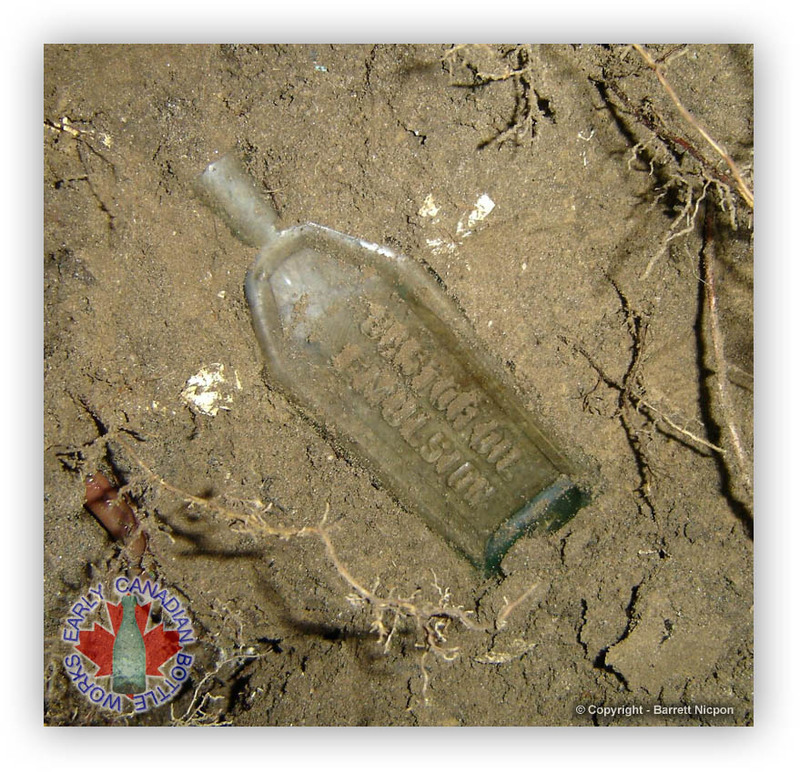 Slowly digging the bottle out, we were both impressed by the sight of a slightly older Wampole bottle than we were used to digging. This one actually had the “Perth, ONT” embossing, and had, again, never before been encountered by either one of us. He dug for a bit longer, pulled out some more broken bottles and unmarked medicines, and then it was my turn. I hopped in the hole, and dug for a few minutes, pulling out a broken teapot, before encountering one of the most stunning green apothecary bottles I had ever seen. It was a tiny little piece, probably for some kind of powder or cream, and a matching stopper came out with it. Unfortunately, only the stopper was in respectable condition - the bottle pieces, or what pieces of it we actually found, were numerous and small. Alas, we pushed forth. 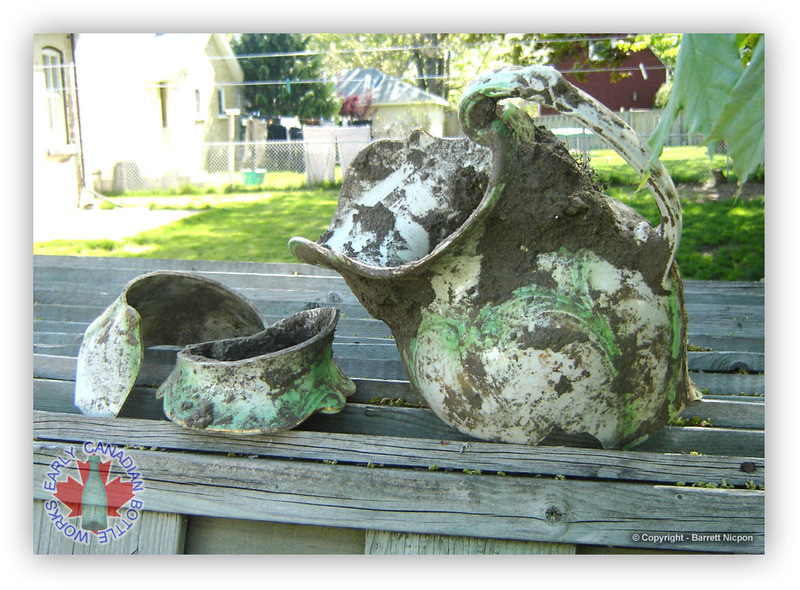 After a few more minutes of digging, I encountered some large metal objects, and some additional broken porcelain, and an unfortunately smashed local medicinal - a “W.H.STEPLER / DRUGGIST / STRATHROY” embossed bottle. Then appeared from the gloom of a seemingly fruitless pit, one particularly large piece of porcelain... one which appeared to be intact. Attempting to dig it out from one side, I was startled to find a brown amber bottle neck sticking out of the dirt. Attempting to dig that out from the side, I was once again startled to encounter that heavenly sound of the gentle ‘clink’ of my shovel against the side of a beautiful European pickle jar with the crudest imaginable lip. Apparently there were some intact bottles in here, after all! Attempting to dig that out from the side, I was slightly less surprised to encounter some additional broken porcelain. Meticulously pulling pieces of a blue-glazed crockery vessel from the hole, I was finally able to remove the pickle jar from the hole (a glorious specimen, and the first I have ever dug! ), and sequentially, I was able to remove the brown amber flask. A nice one it was - out of the ground came a “MALTINE / MF’G CO / CHEMISTS / NEW YORK” tooled-lip piece with what appeared to be a hinged mould type base. After removing it, and basking in its beauty for a moment, I proceeded to attempt the removal of the large porcelain piece. Much to my dismay, I found that it wouldn’t budge. An intact handle appeared on one side, and the most ornately formed lip, with gold-painted edging appeared on the other. The whole thing looked good, until I followed it down to the base. It “ended” right at the fence post column I had encountered earlier. It just didn’t appear that it was intended to “end” there. Seemed like it should be a tad bit longer. Regardless, I attempted to remove some more dirt from the spot where the amber chemist bottle was. It didn’t surprise me in the slightest that I should encounter yet another bottle. I was please to spot what appeared to be a FELLOW’s CHEMISTS bottle at the end of my shovel. Dislodging it by the neck, I was saddened to see that it was a Fellow’s, and that the entire base had been broken off. This particular bottle appeared to be much older than the rest, as well, with what appeared to be an applied lip of some sorts. The glass was full of bubbles, and the lip was absolutely the crudest imaginable chunk of glass. Working further to remove the large piece of porcelain, I was finally able to dislodge it, and much to my horror, the most beautiful and ornate washstand pitcher I had ever seen had the entire base and a large chunk of the back missing entirely. I turned up the base a few inches underneath it, but it appears the post-hole digger which put in that fence post did a number on the rear. I’d like to tell you it was gloomy and unsuccessful from there on in - but it wasn’t. Kyle hopped in the hole to have his turn. While he was digging, and pulling out common, unembossed medicinals, I was examining the tragedy that was the washstand pitcher. It was full of dirt, so to lighten it up a bit, I shook it out onto the pile of dirt on the tarp, and, much to my surprise, out came a small bottle! Picking it up, I was once again elated to read the embossing “W.H.STEPLER / STRATHROY, ONT”. This was my first ever intact local medicine! I reported to Kyle, who was also extremely surprised to have turned up an intact specimen of these desirable little medicinals. Kyle pulled out a tiny amber vial, very crude in appearance, and we were excited, as we had never before seen one such vial in any colour other than clear. He dug a broken whisky bottle, and a few more broken medicinals and teacups, and then gave up his position in the hole. The digging continued - and Kyle was becoming disheartened, as it appeared I was having all the luck. In this turn I pulled out the only embossed milk glass bottle I have ever found (a common N.Y. cream jar), another broken W.H.Stepler, and three ink wells - one a beauty of a cobalt blue colour, with a tooled lip! Of course, as inevitably happens, I became tired, and gave Kyle the opportunity to dig. Around this time, the owner came out, and we had a bit of a conversation. While we were talking about the digging, in the background I heard Kyle’s voice, “I got something - looks like a whisky.” Not thinking much of an unmarked whisky, I continued to talk with the owner. A few moments later, Kyle’s voice again emanated from the hole, “There’re two bottles, one has ‘T.H.H.’ embossed on the base.” Now, I know Kyle quite well by now, and excitement shows easily in his voice - just as well as sarcasm and humour. In this instant, I could tell he was excited, not sarcastic or humourous. “I think I got something good, man.” came that all-too-familiar voice. I told the house owner that when Kyle says it’s good, it’s got to be good. By this point, Kyle had pulled the whisky out, and tossed it down in the hole without even giving it a second look. After a few more minutes of quiet burrowing on Kyle’s part, he all of a sudden emerged from the hole with a beautiful thing. Sure enough, Kyle’s excitement was warranted, as he held in his hand a 30 oz. Ontario pictorial soda embossed “T.H.HUTCHINSON / TRADE MARK / REGISTERED / ST.THOMAS, ONT” with glorious whittle mould. These are the bottles with the embossed monkey holding a seltzer bottle. To say the least, we were both as excited as 5 year-olds at our first sleepover. Yes - my theorum had proven true - there had been at least one good bottle in this backyard, and Kyle had saved the day by finding it. After that, things continued in their usual fashion. I jumped in the hole to do some digging, and Kyle just kept fondling his Hutchinson. 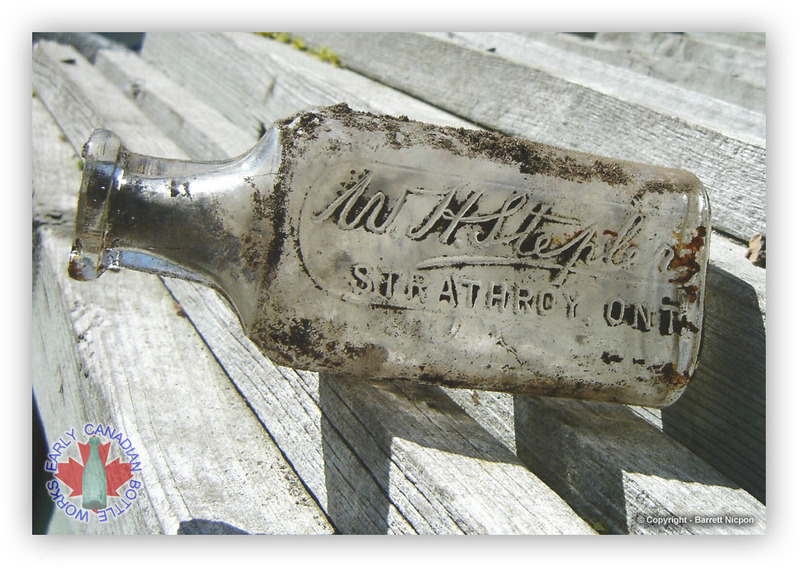 Digging out the direction Kyle had been, and hoping for a major discovery of my own, I soon encountered some bottles - all broken, with the most intact piece being a badly cracked and decapitated “CASTOR OIL EMULSION” bottle, embossed “A.WILSON & Co. / HAMILTON, ONT”. The bottle was a beauty - panelled all the way up the shoulder, with bold, crude embossing. We had evidently hit some older stuff. Having encountered the edge of the pit in that direction, I resorted to digging through a sheet of metal which had previously hindered our digging efforts. I was soon confronted with another ash layer, this one back to the 1910-1920 era we had been digging before. After pulling out a few more unembossed medicinals and a Welch’s grape juice bottle, I was pleased to be witness to several thick, brilliant blue pieces of glass falling out of the sides of the hole. Picking one up, I examined it, and asked Kyle what he thought. He didn’t know, either. Then, continuing to dig, I pulled out a much larger piece of the peacock blue glass. Kyle immediately identified it as a seltzer bottle - the thick glass was unmistakable. Now the question was - was it marked, and if so - where was it from? Continuing to pull pieces out, Kyle soon had enough to assemble the front panel, and the name “J.TUNE & SON / LONDON, ONT” were spelt out for him in beautiful blue. We continued to pull pieces out, but once again encountered the pit edge in this direction. It appeared the fun was over. 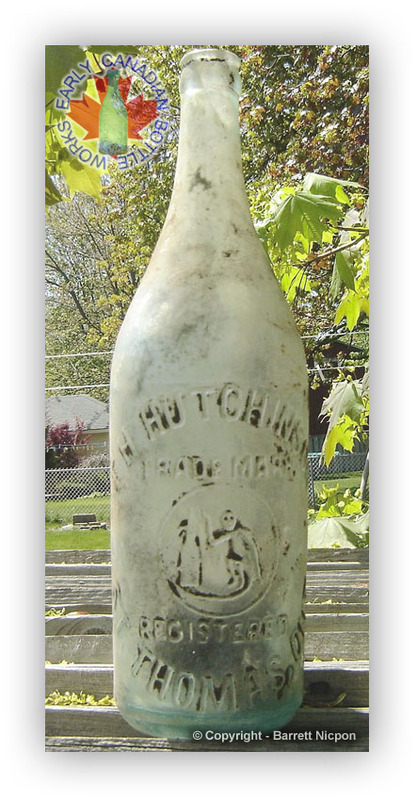 So - gathering up our seltzer shards, our T.H.Hutchinson, and all the other bottles, we proceeded to figure out what was worth keeping, and what should be thrown back into the hole or given to the property owner, who was slightly interested in our finds, it seems. I confronted him and asked if he would like a few - his still-amiable responsiveness gave the indication that he didn’t really want any all that bad. We left him some, anyways. We filled the hole in, and helped to flatten his soon-to-be sodded lawn out. It’s a distinct feeling after digging a good dump or privy - a happy, nostalgic reflectiveness. You’re glad you’ve had the experience, but at the same time, you wish it hadn’t happened, and that you could go back and do it again. A couple glorious gems to add to the collection, and Kyle & I were walking out of that backyard between the gates to wash our finds, and to be nostalgic. As a subsequent note, though - we were able to overcome the happy reflectiveness relatively easily. As of one or two days later, we already had 2 more back yards to dig in the near future. The best way to overcome a sense of burdening reflectiveness is to do something to keep your mind on the present - like dig bottles. And, that we will do.